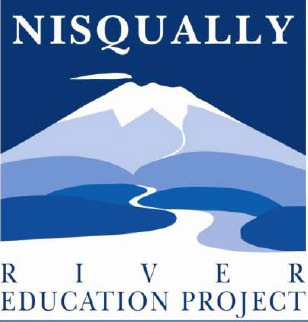 Nisqually River Education Project offers hands-on environmental service-learning to students grades 4-12. Schools in Thurston County, North Thurston Public Schools, Wa He Lut Indian School, and Yelm Community Schools may be eligible for participation. Bi-annual water quality monitoring field trips. Eye on Nature field trips to the Nisqually National Wildlife Refuge. Habitat restoration work-revegetation, invasive species removal, salmon carcass tossing, etc. Annual Student Congress with 400 students from 40+ schools around South Puget Sound to analyze watershed health and learn new skills. Annual Summer Teachers Institute with clock hours, stipends, curriculum resources and networking with community professionals. Logistical support for community service and education outreach projects. Ongoing teacher training and resource sharing. Funding for field trips and water quality monitoring equipment.